I first saw a video posted by Nusret Gökçe a.k.a. Salt Bae, about 3 months ago. 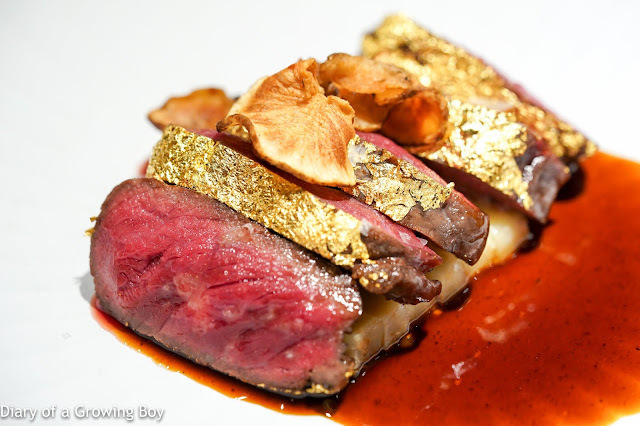 After cooking a piece of beef, he proceeded to roll it on a plate sprinkled with gold flakes. 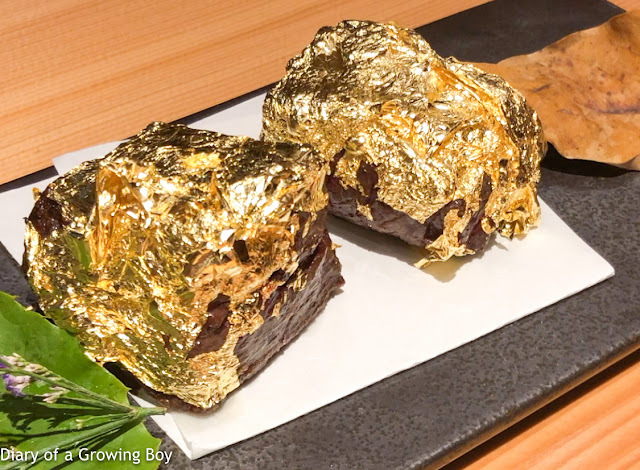 Some days later, he followed up with a picture of a piece of beef which had been completely covered in sheets of gold leaf. As a joke, I forwarded these posts to Agustin, and told him that's what I wanted. His reply? "CHALLENGE ACCEPTED"
So we chatted back and forth about it, but I never got around to setting a date for it - partly because of my pretty full feeding schedule, but also partly because I needed the right partner in crime. At a meal earlier this month, I asked The Man in White T-shirt whether he would accompany me for the stunt... and he said "yes". Which is how we ended up here today at lunch. Unbeknownst to me, the restaurant's hardworking PR was also entertaining a visitor from Norway who we have contact with... and with whom I was just trading messages mere minutes before arriving at the restaurant! We started with a series of welcome bites. 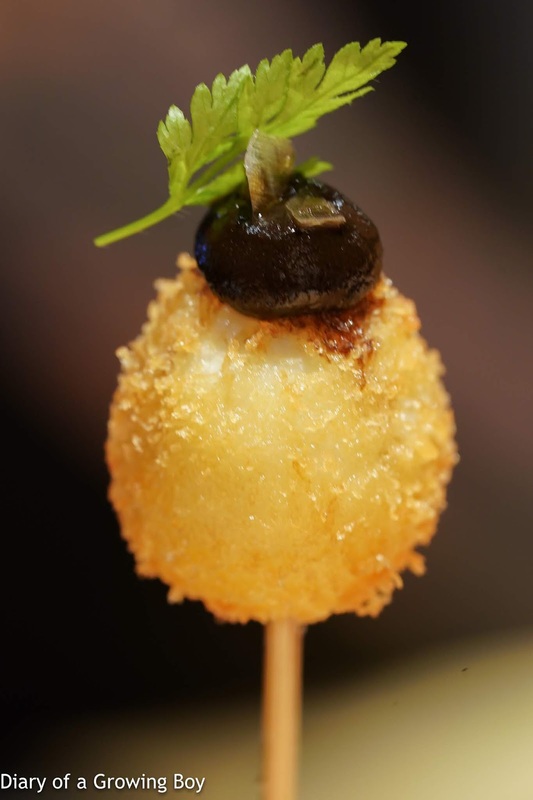 Quail egg - battered and deep-fried kushiage (串揚げ)-style, with black garlic purée, salt, and chervil. 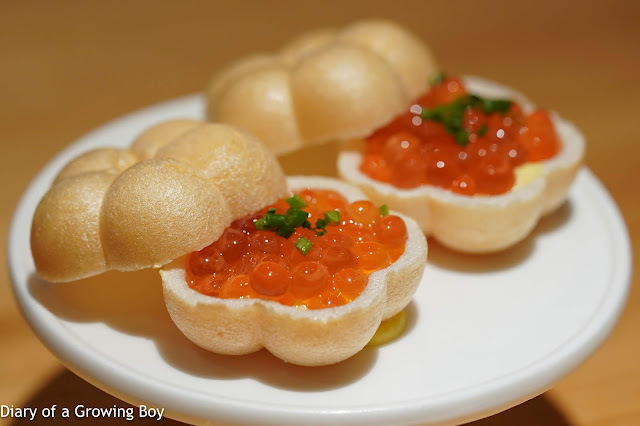 Monaka (最中) - with some egg yolk, a layer of salmon roe, and some chives on top. The curing of salmon roe was just right and not too salty. 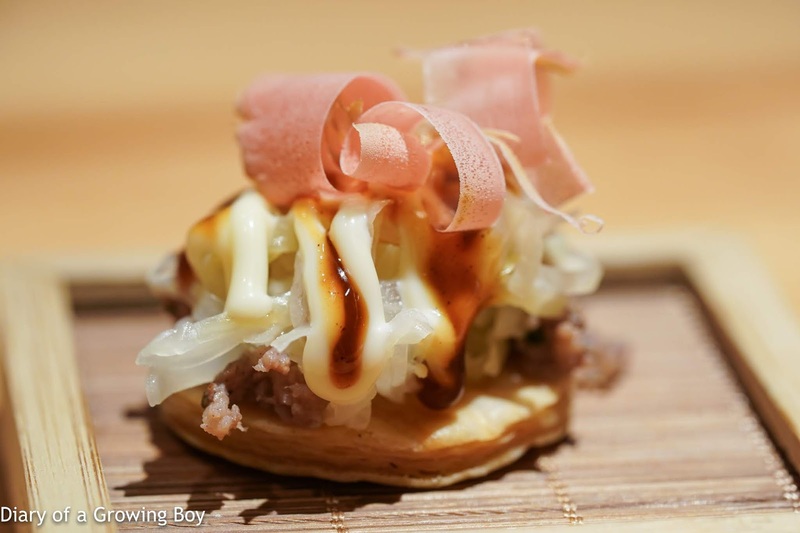 Okonomiyaki (お好み焼き) - crispy puff pastry at the bottom, with crunchy cabbage and katsuobushi (鰹節) flakes on top. It really did taste like okonomiyaki. 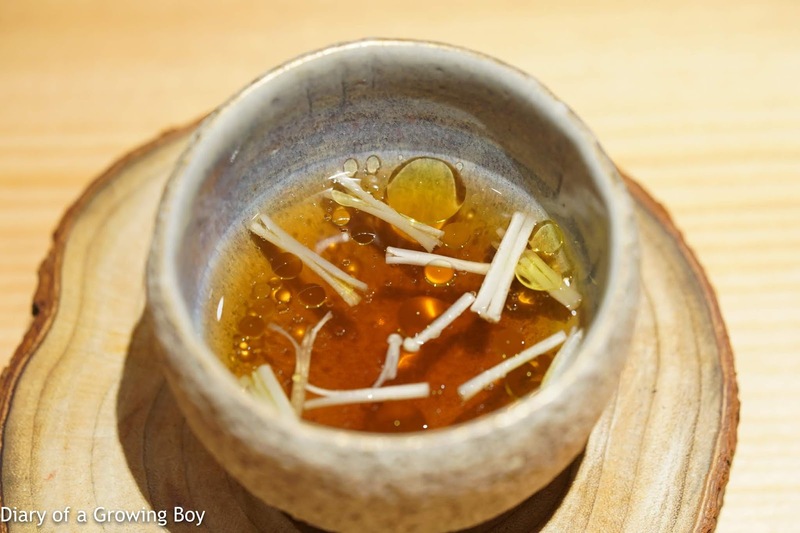 Consommé - made with dried mushrooms, kelp (昆布), jasmine tea, and crunchy stems of enoki mushrooms (えのき茸). Then came the sashimi platter (刺身盛合せ) platter. I can't believe I forgot to take a picture of the whole ensemble, because the presentation is just so, so pretty! 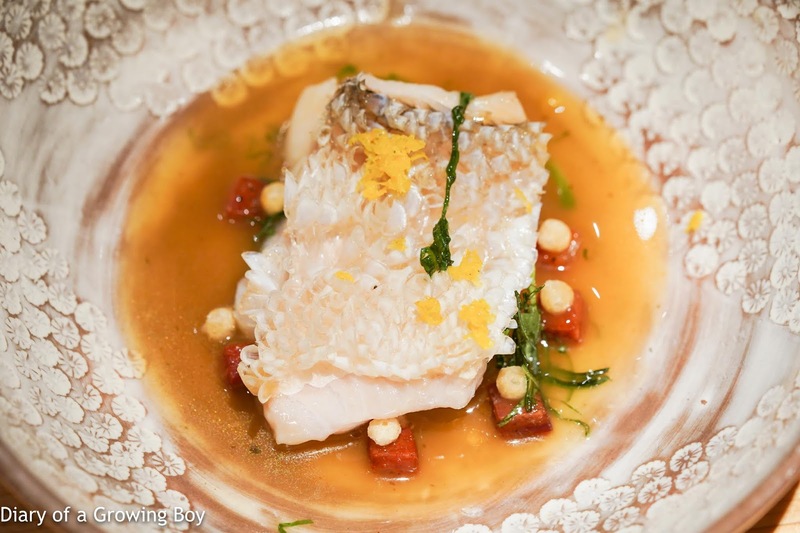 John Dory (的鯛) - from Fukuoka. 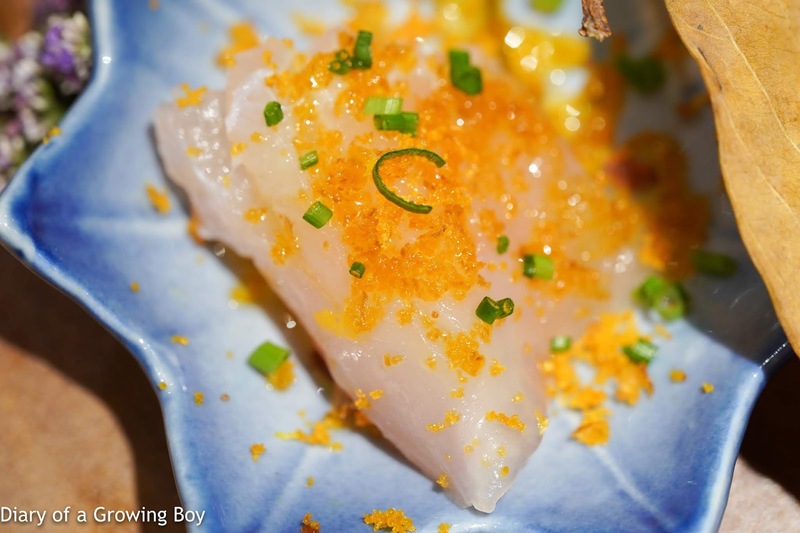 Served with shaved karasumi (カラスミ) and yuzu (柚子) zest, olive oil, and chives. 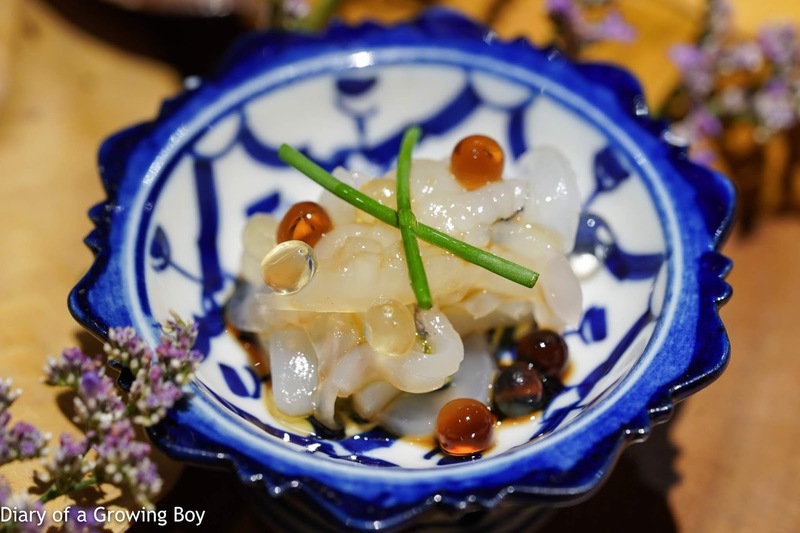 Spear squid (槍烏賊) - dressed with smoked soy sauce, scallion sprouts (芽ネギ), yuzu pearls, and soy sauce pearls. I gotta say that the "pearls" worked very well. 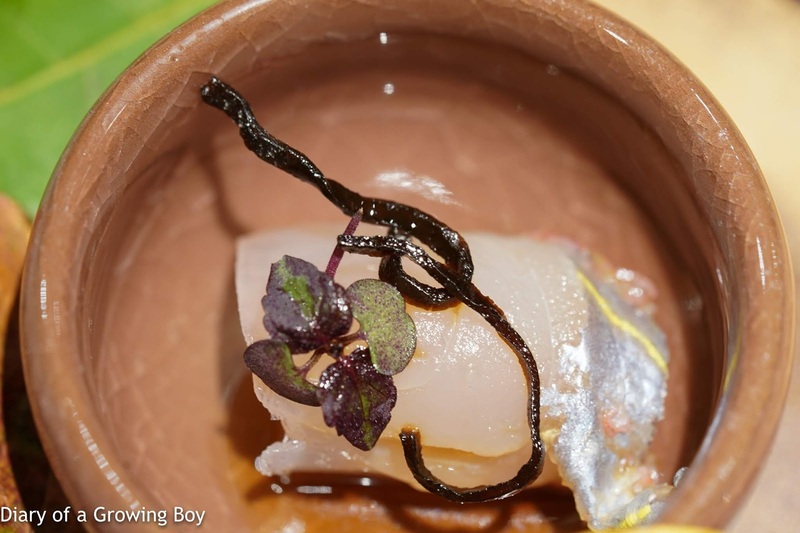 Golden threadfin bream (糸縒り鯛) - with some ponzu (ポン酢), salted kelp (塩昆布), and some red perilla leaves. The fish and fatty and tender, almost melted in my mouth. The kelp had a nice bite to it. Striped bonito / akegarashi (歯鰹 / あけがらし) - smoked by putting hot charcoal directly on the fish. Topped with some akegarashi and myoga (茗荷). This, too, was very soft and melted in the mouth... in fact it was softer than the golden threadfin bream. 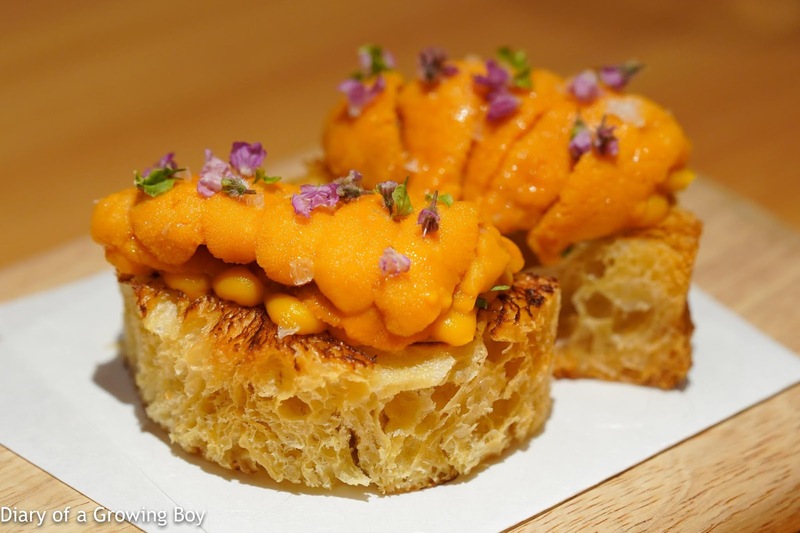 Hokkaido uni / brioche / hanaho - well... yet another of Agustin's signature dishes which I have seen numerous pictures of. And it certain is a dish made for Instagram, with all those pretty perilla flowers (花穂) on top. Underneath the sweet and creamy tongues on Japanese sea urchin - just above the toast which was supposed to have a consistency between brioche and pannetone - was some butternut squash purée to add some moisture. 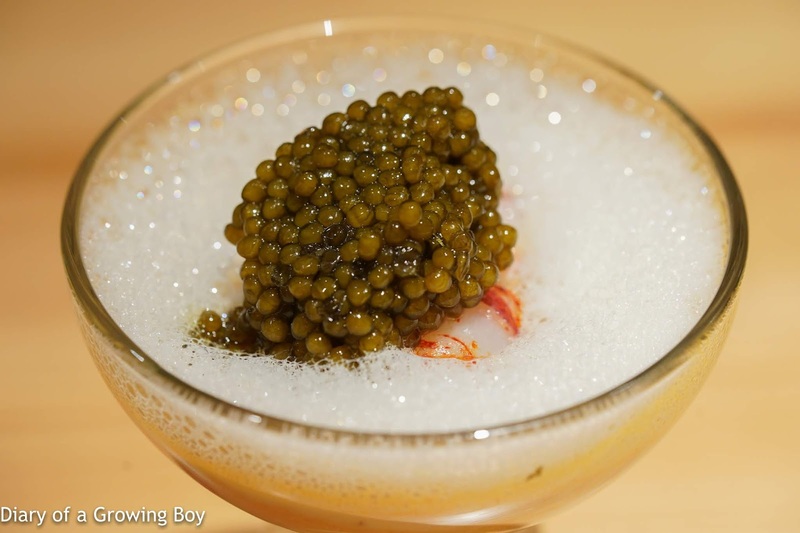 Ise ebi / cauliflower / Kristal caviar - at the bottom of the cup were croûtons, which were buried under some cauliflower purée that had been cooked with some konbu, and some smoked and dried cod roe (fleur de maviar), plus sauce made from the head and shell of the Ise lobster (伊勢海老). 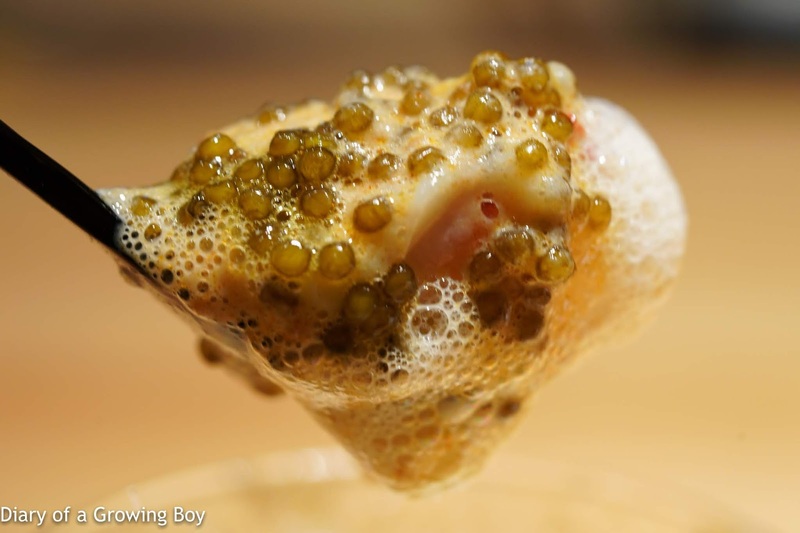 On top of the two chunks of Ise lobster was a dollop of smoked Kaviari Kristal caviar. To be honest, both The Man in White T-shirt and I forgot that there were croûtons at the bottom... so even though we had dug with our spoons, we didn't quite get everything in the same mouthful. In fact, I only got to the croûtons when there was no lobster and almost no caviar left. So we didn't get the full effect, which was perhaps why I didn't quite understand why the coûtons were there. Amadai / soy beans / chorizo / konbu - the tilefish (甘鯛) was cooked by pouring hot oil over it, which also has the effect of making the scales crispy. The texture of the fish was, of course, wonderful as expected, but I felt that the fish was probably cooked without any seasoning... and could have used some. 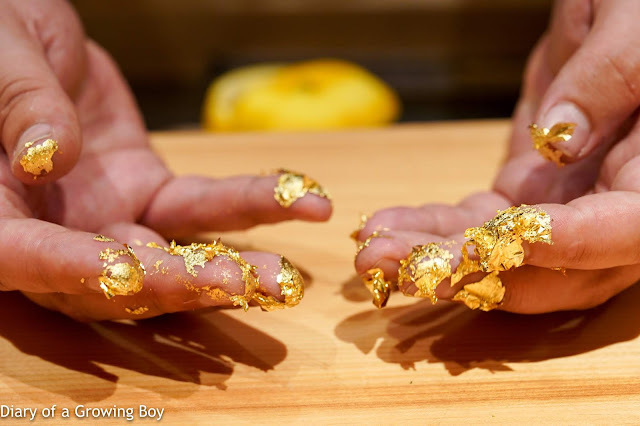 Goldfinger probably was counting on the sauce for flavoring, as it was done with roasted fish bones, chicken wings, soy sauce, and a little yuzu. The little cubes of chorizo - made with meat from 4-year old Dorado Graditano pigs and pimenton de la vera - seemed a little more spicy than usual. The puffed quinoa added a bit more texture, while the yuzu zest shavings and perilla leaf chiffonade added some nice fragrance. Agustin started the prep for the next dish without giving me a heads up. By the time I realized what was happening, he had already transformed into Goldfinger. BABY, THIS IS WHAT YOU CAME FOR! 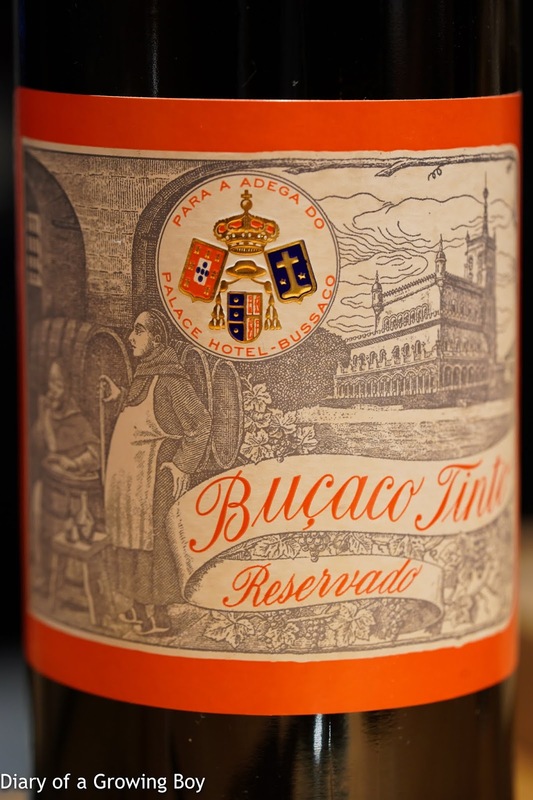 Rubia Galega from Vacum, coming from cattle that was 16 years' old and dry-aged for 100 days. And lovingly wrapped in gold foil by Goldfinger. Rubia Galega / Jerusalem artichoke / moromi miso - the execution of the beef was pretty good, although the crust was a little harder than I had expected. 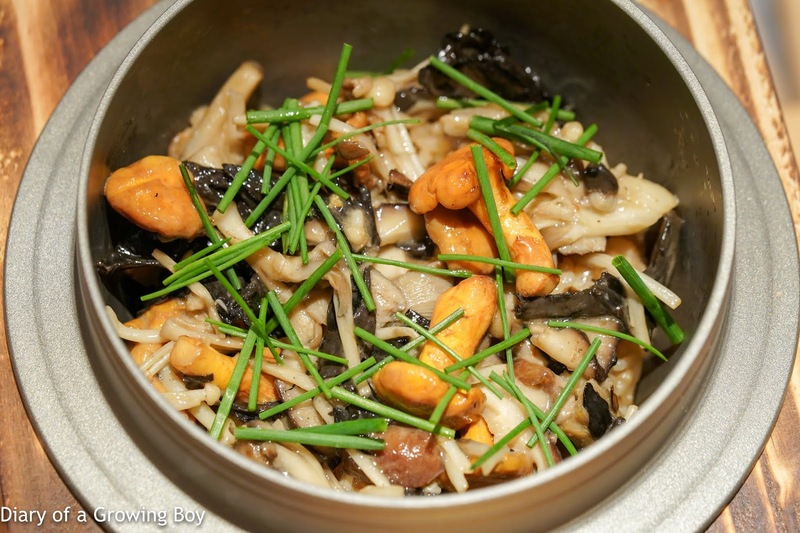 Served on a bed of Jerusalem artichoke batonnet, and topped with some Jerusalem artichoke chips. Besides the jus, there is a little dab of moromi miso (醪味噌). But I didn't think it was needed. Since it's a workday and this was lunch, I chose not to take the wine pairing from sommelier Wallace Lo. It did look very interesting and clearly a lot of thought had been put into it. 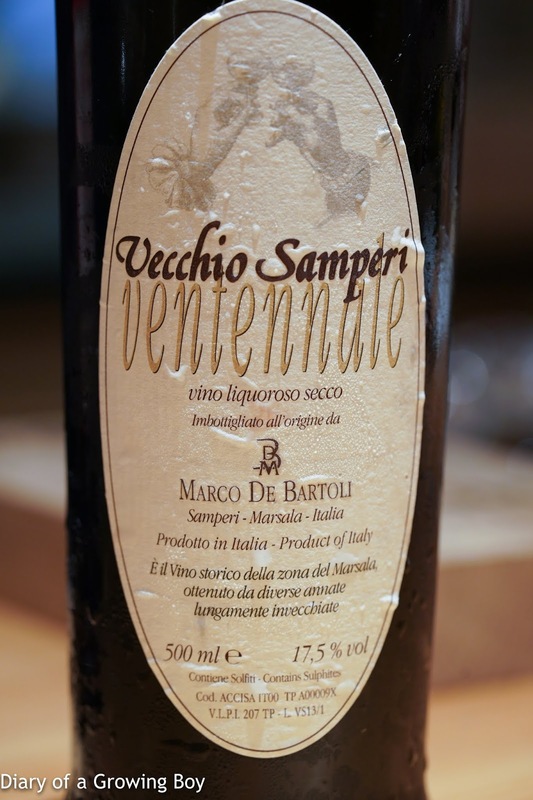 But when it came to the beef, I did ask to taste the two wines paired with the beef course. 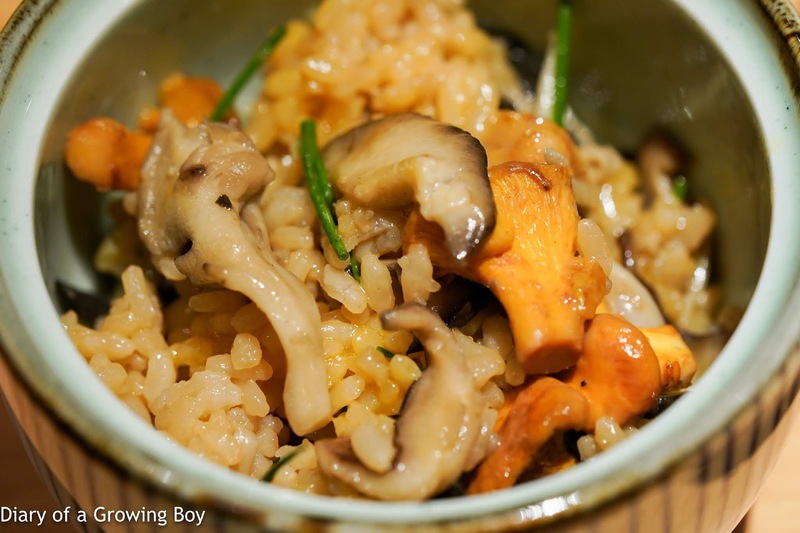 Seasonal mushrooms / yolk / Koshi Ibuku rice - mushrooms such as girolles, maitake (舞茸), shiitake, and enoki came from France, China, and Japan. The Koshiibuki (こしいぶき) rice was cooked in soy sauce and dashi (出汁). This was so, so, so delicious. I wish I had room for another bowl or three. 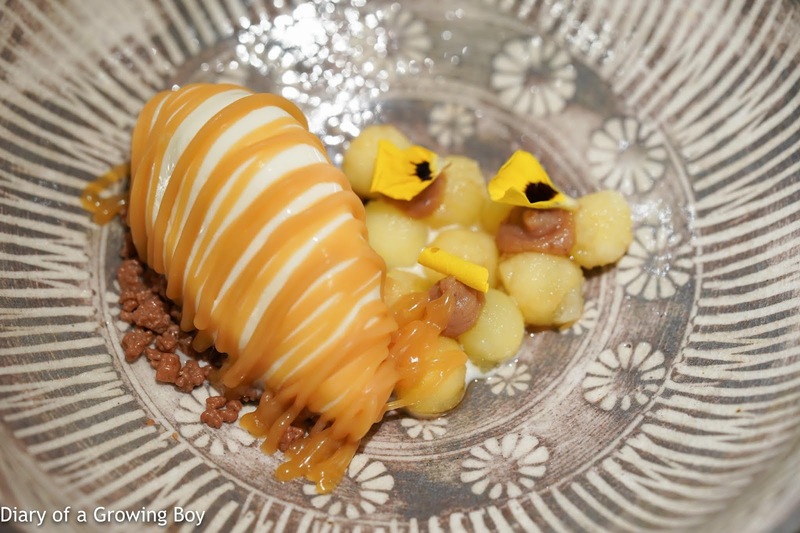 Mikan textures / meringue / sorbet - the Japanese mandarin (みかん) from Ehime Prefecture (愛媛県) was served with different textures... as fresh wedges, with chiffonade of mandarin peel cooked in syrup, a quenelle of sorbet, and finally the mikan was frozen and then shaved on top. 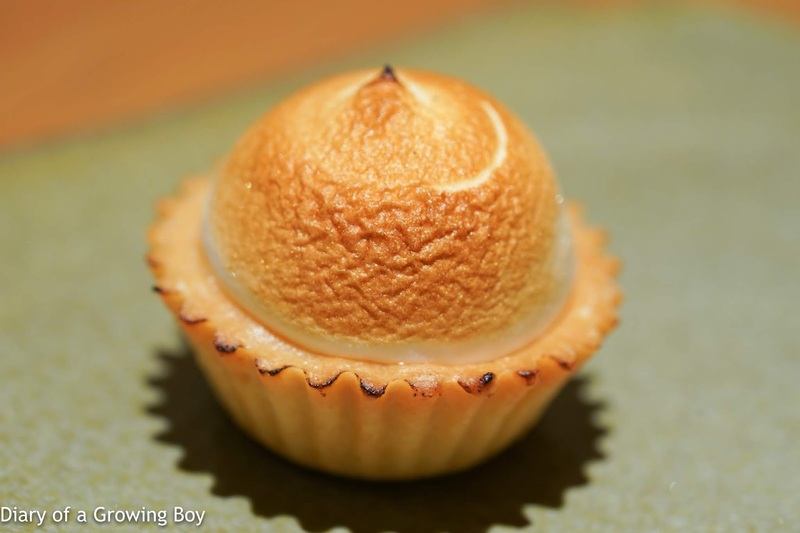 Served with some meringue. This was very refreshing, and perfect. 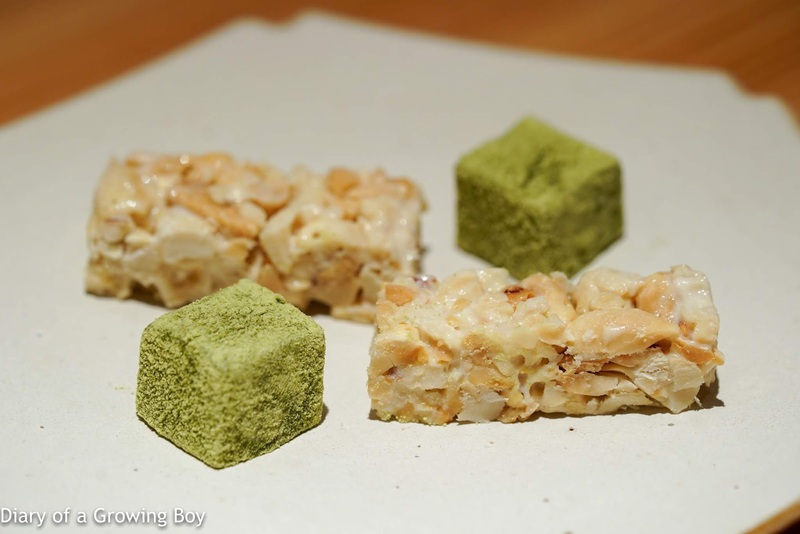 Matcha warabimochi (抹茶わらび餅) and nougat - the latter came with lots of peanuts.